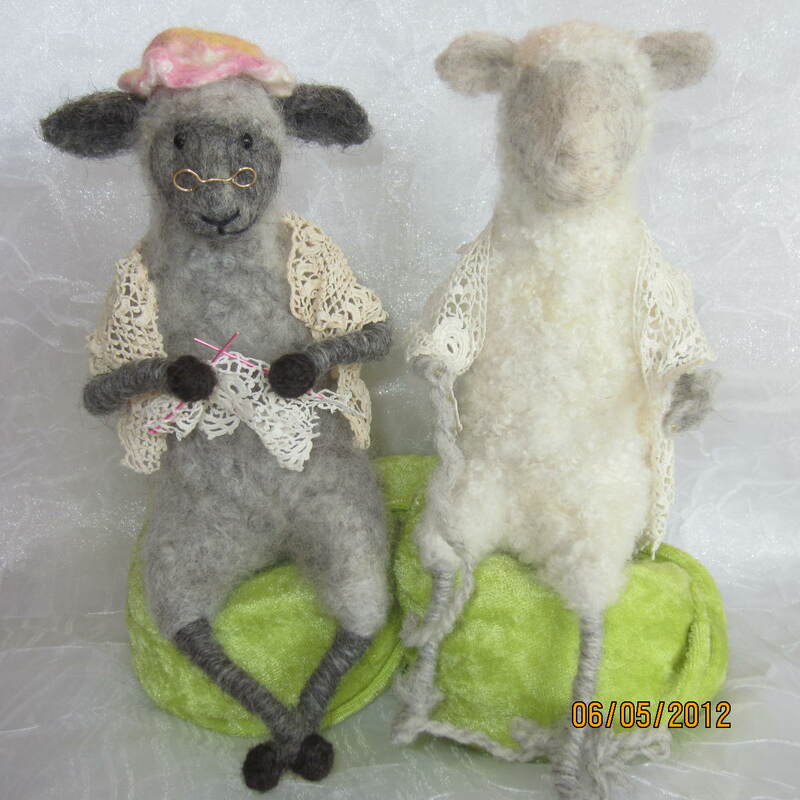 These hand-made sheep will debut in the Whimsical Ewe booth at the 2012 Black Sheep Gathering, June 22, 23 & 24th. 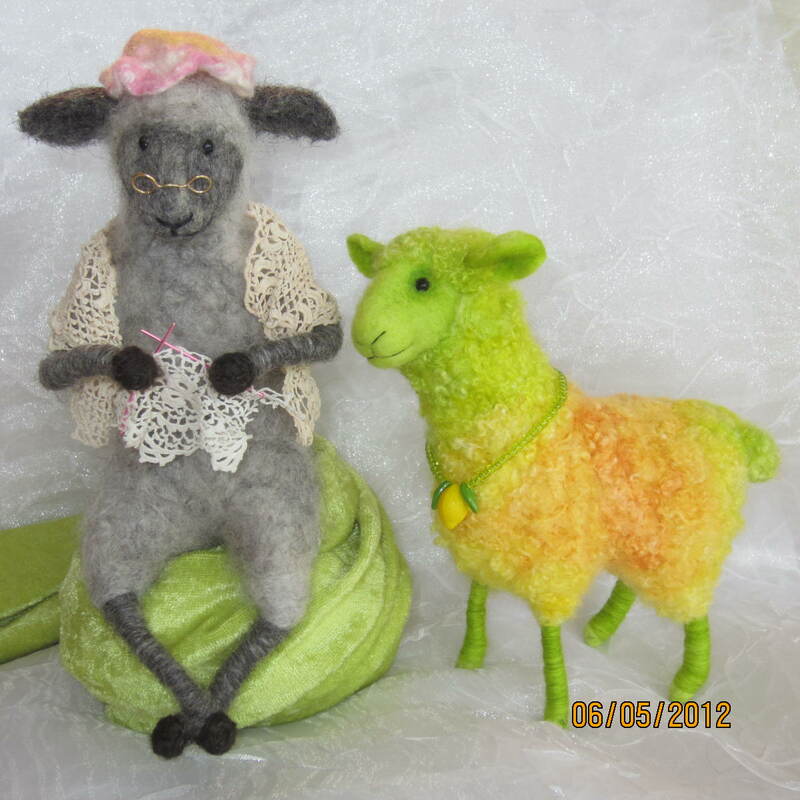 New needle felted sheep for Black Sheep Gathering: Knitting Sheep and Citrus sheep. Of course there would be a Knitting Granny sheep. It’s fun to ask “What would it look like?” How to convey the idea with minimal accessories? After all, I haven’t got a little rocking chair (okay, I do have the chair, but not a sheep currently the right size to fit inside it, so that rocking chair idea is slated for Oregon Flock & Fiber Festival.) Instead of nekked, we have the shawl draped around the shoulders. Granted it’s a piece of antique crocheted lace (sshhhh it’s not knit) but I don’t have TIME at the moment to knit a pretty miniature shawl, however much I love the idea & crave the opportunity (again… aiming for OFFF). Also, Granny Sheep has her bifocals to help her SEE her tiny stitches. She’s wearing a felted cap (actually a wee felted flower scrounged to convert into a mop cap) and she has ~ at the moment & solely for photo purpose ~ got a bit of lace on wire knitting needles. By show time, she really will have a ball of yarn and a bit of actual knitting on better needles. CITRUS SHEEP: sheep with a sour tang! Pardon? What exactly is a “Citrus Sheep?” Oh, you didn’t know there was such? Well, WHO do you think mows the grass under trees in acres of citrus grove? Hmmmmm? Yeah, some critter’s gotta do it! And the effect of all that tart citrus grove grass has a decided effect upon the flock, as you can’t help but notice. Citrus sheep be rare sheep indeed. They come out to graze on only the sunniest of days, so folks thinking they got a peek at something amazing are left wondering if maybe it was a trick of the sun glare in their eyes. “Pssst!” Rumor has it that ~ in the next field over ~ there be such critters as…..Watermelon Sheep. I myself thought I got a peek, but haven’t yet managed to catch it. I’m laying the trap as I type. And then….over the summer, I’m planning a special expedition to capture exotic floral sheep from afar. Stay posted for further developments. 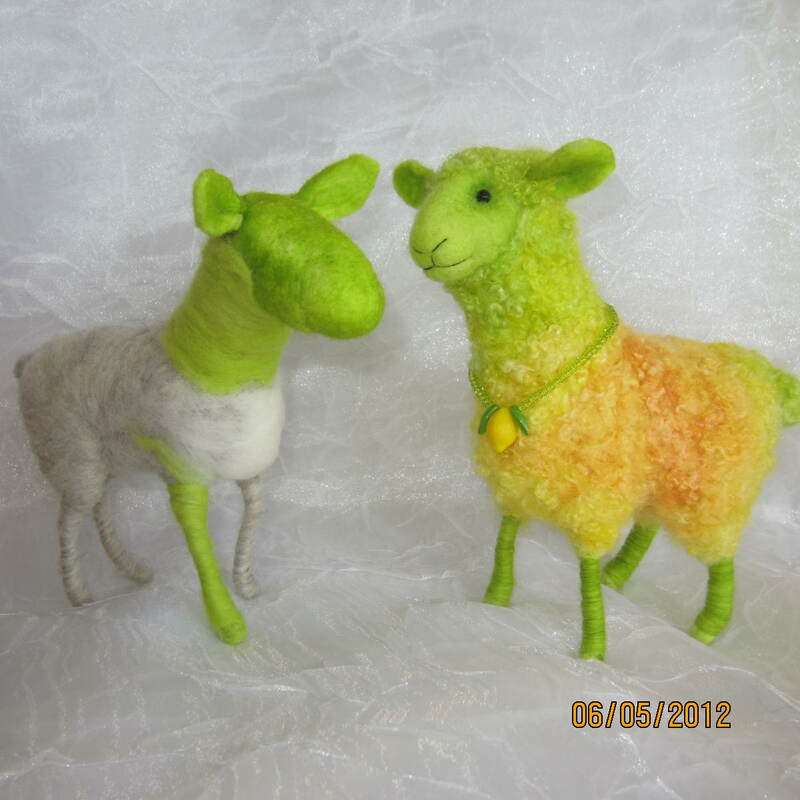 2 Citrus Sheep, + 1 in progress that needs to ingest more citrus grove grass! This Granny is one of our popular KNITTING SHEEP, and while she sold last year, there certainly will be more Knitting Sheep at Black Sheep Gathering 2013 (Lane county fairgrounds, Eugene OR. Knitting Sheep will appear again in September, at Oregon Flock & Fiber Festival in Canby, OR. Each sheep varies; each is ewe-nique. They may have gray, black, brown or white fleece. Perhaps one day a green sheep will appear! Being ewes-of-a-certain-age, these gals can see their knitting better thru bifocals. They wear lacy socks, felted mop caps and antique or vintage handmade lace ‘shawls.’ Most of their bags are actually knit in the round on size 0000 dble-point needles, with teeny tiny stitches. And, each Knitting Sheep perches contentedly on her own comfy little tuffet seat.